By the end of 2020, OPPD expects more than 50 percent of its retail electricity sales to come from renewable sources, most of that from wind turbines . . . The math is pretty simple. 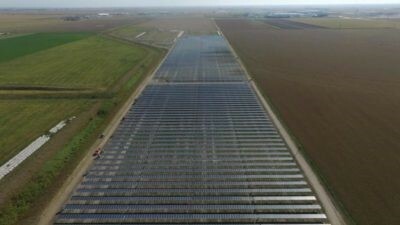 “When you pair the district’s supply-side suite of energy generators with someone who wants to go up to 50 percent participation in a community solar program, they would at that point achieve 100 percent renewable energy designation on an annual basis,” Brad Underwood, OPPD’s director of corporate planning and analysis, told the utility’s board of directors on Tuesday . . . Of course, the variability of wind- and solar-powered generators means that the 100 percent designation would be theoretical. Read the entire article here. In his article, Cole Epley references Fremont’s Community Solar. 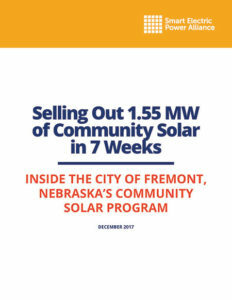 Last December the Smart Electric Power Alliance (SEPA) completed a case study: Inside the City of Fremont, Nebraska’s Community Solar Program, which can be downloaded here. Save the Date! On April 5, 2018 from 1 to 2 pm, SEPA will present a webinar called, “Avoiding the Growing Pains of Community Solar.” The speakers will include Brian Newton, City of Fremont Administrator and Fremont Department of Utilities Manager. This entry was posted in Community-Scale Solar, Nebraska / Midwest News and tagged Cole Epley, Fremont's Community Solar, Nebraskans for Solar NewsBlog, Omaha World Herald, OPPD's Community Solar, Solar Electric Power Alliance (SEPA) on February 14, 2018 by Helen Deffenbacher.